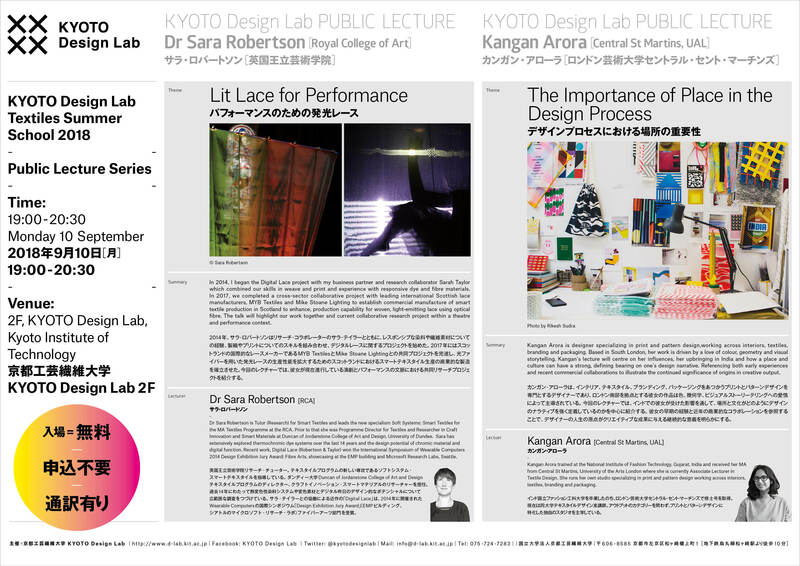 KYOTO Design Lab [D-lab] will hold the public lecture series by Dr Sara Robertson [RCA] and Kangan Arora [Central Saint Martins, UAL] related to the D-lab Textiles Summer School 2018. In 2014, I began the Digital Lace project with my business partner and research collaborator Sarah Taylor which combined our skills in weave and print and experience with responsive dye and fibre materials. In 2017, we completed a cross-sector collaborative project with leading international Scottish lace manufacturers, MYB Textiles and Mike Stoane Lighting to establish commercial manufacture of smart textile production in Scotland to enhance, production capability for woven, light-emitting lace using optical fibre. The talk will highlight our work together and current collaborative research project within a theatre and performance context. Dr Sara Robertson is Tutor (Research) for Smart Textiles and leads the new specialism Soft Systems: Smart Textiles for the MA Textiles Programme at the RCA. Prior to that she was Programme Director for Textiles and Researcher in Craft Innovation and Smart Materials at Duncan of Jordanstone College of Art and Design, University of Dundee. Sara has extensively explored thermochromic dye systems over the last 14 years and the design potential of chromic material and digital function. Recent work, Digital Lace (Robertson & Taylor) won the International Symposium of Wearable Computers 2014 Design Exhibition Jury Award: Fibre Arts, showcasing at the EMP building and Microsoft Research Labs, Seattle. Kangan Arora is designer specializing in print and pattern design,working across interiors, textiles, branding and packaging. Based in South London, her work is driven by a love of colour, geometry and visual storytelling. Kangan’s lecture will centre on her influences, her upbringing in India and how a place and culture can have a strong, defining bearing on one’s design narrative. Referencing both early experiences and recent commercial collaborations to illustrate the continued significance of origins in creative output. Kangan Arora trained at the National Institute of Fashion Technology, Gujarat, India and received her MA from Central St Martins, University of the Arts London where she is currently Associate Lecturer in Textile Design. She runs her own studio specializing in print and pattern design working across interiors, textiles, branding and packaging.